Prompting the proclamation in Pulse! 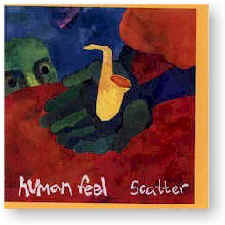 magazine “In a jazz world dominated by Stepford-like traditionalists, this band’s a breath of fresh air,” comes Scatter by the Boston-New York based Human Feel, a group that has been together over a decade. Starting in their teens as fellow band members in Seattle, the band moved to the east coast in 1987, releasing a self-produced CD that in 1989 landed the Cash Box Jazz Chart Top 30, among other awards and accolades. The roots of Scatter lie in the great legacy of jazz and in its diversity reflecting the many varied experience of the ensemble members, while at the same time creating a sense of unity. Oneness is achieved out of the band’s desire to play music that honestly conveys the thoughts, feelings and emotions they experience in life. The title Scatter refers to these concepts of diversity and unity, which are combined to create a music that is purely Human Feel. Recorded on 14 April 1991.